After a long time spread in between, Apple’s iPad Air 2 finally received a proper successor! Technically, the iPad Air (2019) arrives nearly 4.5 years after the iPad Air 2, which is a staggering amount of time in the world of tech. 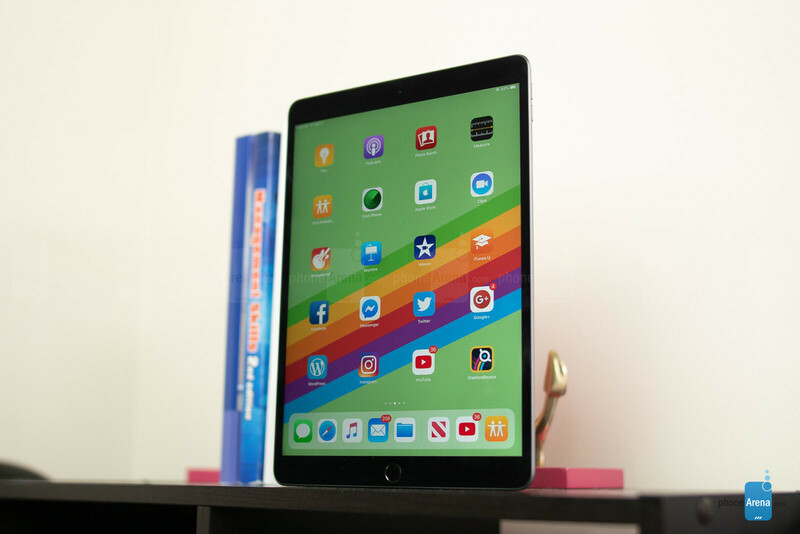 Until the arrival of the iPad Pro, the Air was largely considered the top of the line tablet in Apple’s stable, but if pricing dictates structure, the iPad Air (2019) is now classified as the mid-range offering – sitting in between the iPad (2018) at $350 and the 11-inch version of the iPad Pro (2018) priced at $800. The $500 sticker price of the iPad Air (2019) seems appropriate for any mainstream tablet, but where does it rank in the greater scheme of things? Borrowing the same aesthetics and design language of its predecessor in the 2014 released iPad Air 2, the new iPad Air (2019) doesn’t barely break from tradition. It can easily be mistaken for the iPad Air 2 unless you inspect them closely, seeing that the iPad Air (2019) is a smidgen longer and wider, but it’s still incredibly well-built, features a sleek aluminum body, rounded edges with a subtle beveled edge. Yes, it’s a recycled design that doesn’t bear anything terribly new or different, but it’s a signature design that stays true to Apple’s philosophy of being clean and simple. Apple has chosen to keep the Touch ID fingerprint sensor. It would have been great if it had put Face ID here, but Touch ID is also very good and simple to use. The 3.5mm headphone jack is still intact here, which is surely a sight for sore eyes given that the newer iPad Pros don’t have them. Looking elsewhere around the tablet, all of the same ports and buttons from before are located in their typical locations. On the bottom edge, we have its Lighting port and two speaker grills that flank it. To the right, we have dedicated volume up and down buttons – while the top houses the power button, headphone jack, and microphone. But interestingly enough, the only new addition here are the three pin connectors on its left edge, which allows for the support of the Smart Keyboard for those who simply prefer a physical response when typing. Moreover, it’s also worth noting the iPad Air (2019) also supports the Apple Pencil, which still incurs an additional $100 cost. There’s a catch though! It’s the first-generation Apple Pencil, and not the newer one. Indeed, it’s been 4.5 years in between the two iPad Air models – so you’d think that this new model would be deserving of a new facelift. Apple doesn’t believe it needs one. And there’s very good reason for that because all you need to do is look at the competition. No one else sells more tablets than Apple, so this “old” design works because it has shown to all of us that it has aged nicely. It’s thin, lightweight, and solidly built. What more can we ask for in a design like that? Even though it may not seem dramatically different if the iPad Air (2019) were placed alongside the iPad Air 2, there are differences in the two displays. For starters, the new iPad Air (2019) features a larger, 10.5-inch 1668 x 2224 Retina Display that’s also fully laminated just like its predecessor for better outdoor visibility. Furthermore, it leverages Apple’s True Tone display technology to adapt colors to the ambient conditions around – while also throwing in support for the wider DCI-P3 color gamut. All of this sounds fancy and enticing for this newer iPad Air, but we wouldn’t go beyond saying it’s leaps and bounds superior than the iPad Air 2’s display. Yes, it’s brighter by nearly 100 nits over the iPad Air 2 with its peak brightness output of 525 nits, but it still delivers the same crisp and accurate colors – in addition to the same accurate color tones. With True Tone on, the Retina Display of the iPad Air (2019) appears richer, skewing towards a slightly more saturated tone, but with the feature turned off, it achieves complete accuracy in the sRGB color gamut spectrum. Just like the design, there’s not a whole lot new or drastically different with the Retina Display here. At the end of the day, it’s effective in allowing us to handle the tablet for reading, watching videos, and getting work done. We’ll cut to the chase here. 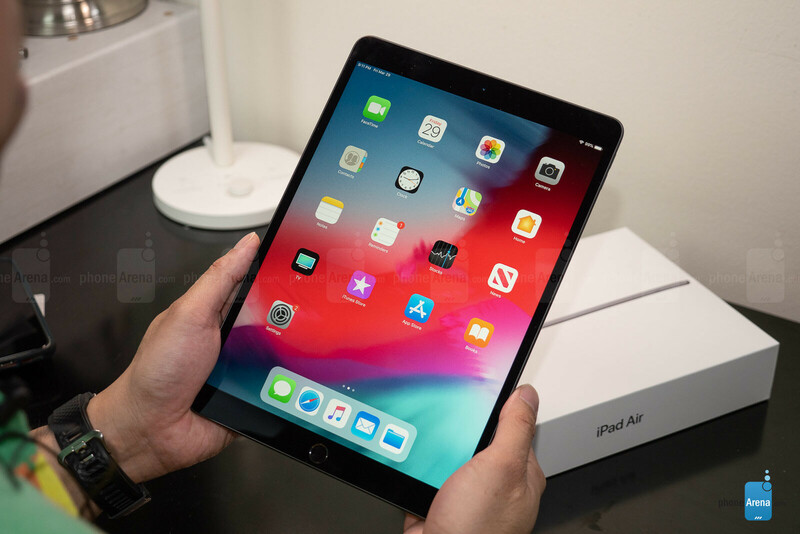 If you’ve held onto the iPad Air 2 and have continually updated its software to the most up-to-date version of iOS, version 12.2 to be specific, then you won’t notice anything different with the iPad Air (2019). In fact, it’s the same experience that you’ll find with other iPads! Don’t be too shocked by this, seeing that continuity with the experience has always been a characteristic among Apple’s tablets. You’ll find a gesture-based interface here, which won’t be a total surprise for any iPad users. Naturally, they’re practical and effective in making iOS 12.2 a versatile tablet platform. The same swipes and multi-finger gestures are in play here, allowing us to access the control center by swiping down from the top-right corner of the UI, switching from app-to-app by using four finger swipes, and even getting back to the home screen at any time with a five-finger pinch gesture. These gestures aren’t new, seeing that we’ve seen them previously before. 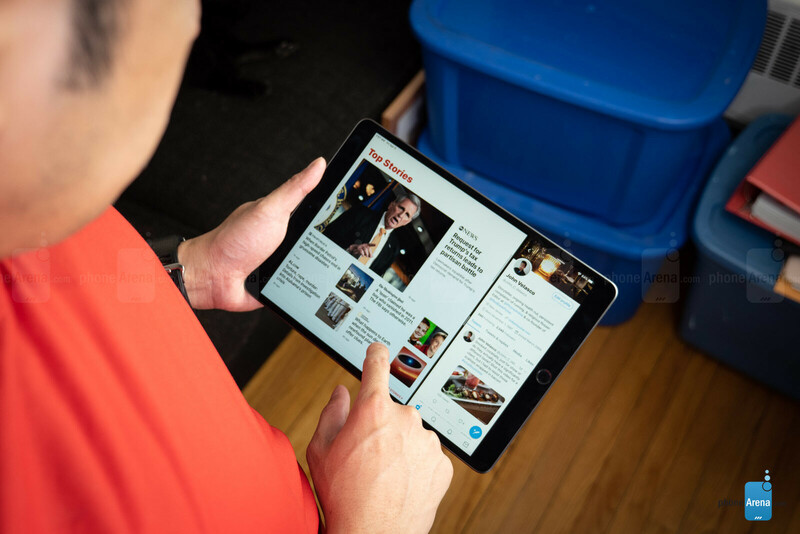 While veteran users of the iPad will feel at home right from the onset, anyone new to the iPad may feel a slight learning curve getting to know the ins-and-outs of the navigational experience. After some time, however, these gestures become second nature. And the beauty of iOS is that it favors simplicity in both how the interface is presented, as well as in the feature set of the experience. We’re big fans of being able to have two apps running simultaneously side-by-side to one another. Technically, though, on limited basis because we’re able to run one of four native apps – iMessage, Safari Browser, iTunes, Mail, and Files – which can then be combined with another app. There are different combinations available here, but not all of them will work. Despite that, it’s nice to know that there’s a level of productivity that’s available now with the experience, as opposed to having to constantly switch between apps. In terms of tablet experiences, Apple has evolved its iOS experience through the various iterations over the years – with this one being obviously more complete. Whether you’re looking to casually doing some work, or just killing time by enjoying a flick or game, iOS 12.2 here on the iPad Air (2019) has everything we need for a tablet. Apple’s iPads have always been notoriously responsive, so don’t expect that to change anytime soon either. 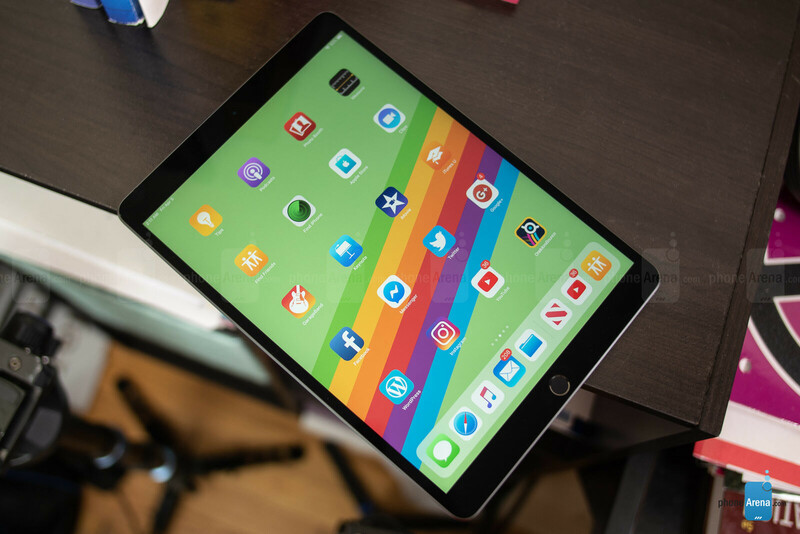 Powered by Apple’s latest A12 Bionic chipset coupled with 3GB of RAM, the new iPad Air is what you’d expect it to be with its performance – exceptionally responsive! We honestly can’t complain about its performance, as it blows its predecessor out of the water with the synthetic benchmarks. Then again, we should expect it to mop the floor with its performance given the significantly updated chipset it’s packing! On the surface, your typical operations such navigating around the interface and running apps seem buttery responsive. But the aging iPad Air 2 still delivers buttery results as well with the same tasks. Even though it may be tough to discern the improvements brought along with the new iPad Air, the area where you’ll see the most improvement will be gaming and other processor-heavy functions. In our time using the new iPad Air, it never once showed any indication of stuttering or slowing down with its performance. When it comes to storage options, there are only two options to choose from – 64GB or 256GB. The price for the 64GB version amounts to $499, while the 256GB one comes in at $649. Considering that there’s no storage expansion whatsoever with Apple’s iPads, the additional $150 you’ll be forking over for the 256GB seems like the wiser choice. People still use tablets for taking photos and videos, so even though we would typically refrain from this practice, we’ll spend some time going over the camera here. 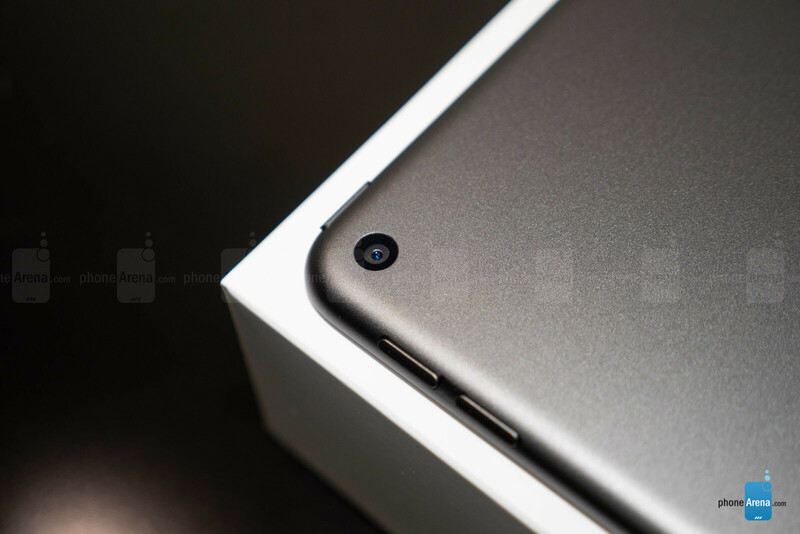 If we’re to look at the specs of the rear camera, it pretty much matches what was offered by the iPad Air 2. What we have here is an 8MP backside illuminated sensor with an aperture of f/2.4. That’s nothing to gloat about in the world of cameras, but then again, we’re dealing with a tablet here. Interestingly enough, it’s the front-facing camera that receives a makeover – featuring an upgraded 7MP camera, up from the iPad Air 2’s pitiful 1.2MP camera. 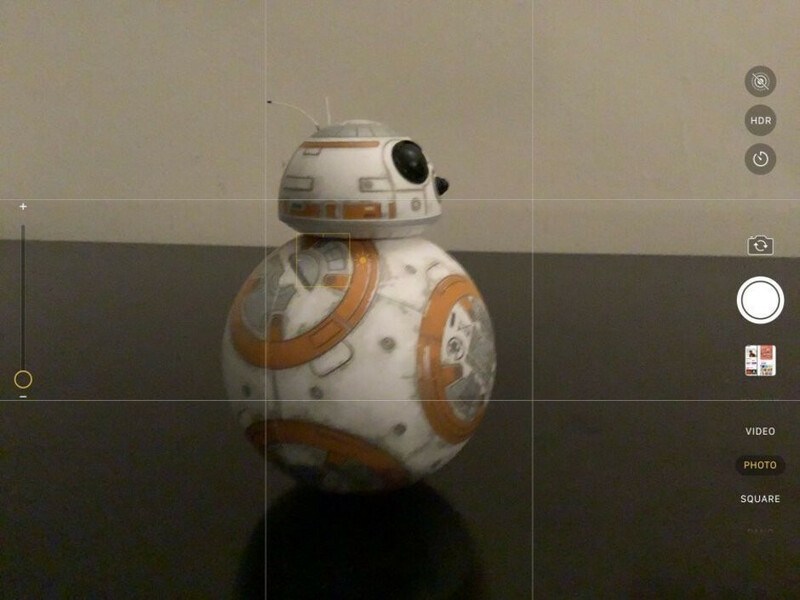 Looking beyond the hardware, not much has changed either with the camera interface. 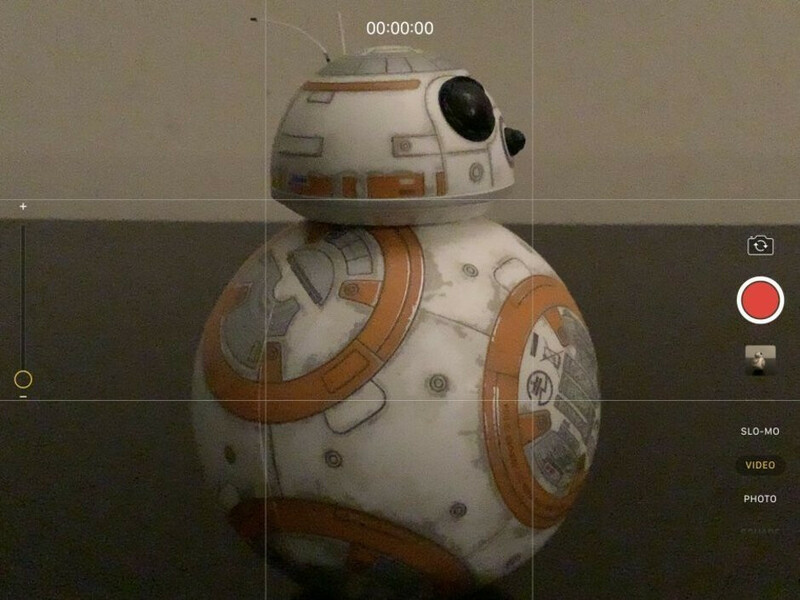 It’s pretty straightforward for the most part, providing us with access to the on-screen shutter keys, the various shooting modes, and some other options that include the timer and HDR. What continues to be a frustration is the lack of being able to quickly access some of the settings! We’re still required to navigate outside of the interface and into the iPad’s general settings to change things like the video recording resolution. Okay, we’ll admit that it takes some pleasant looking shots when the lighting conditions are ideal. Under sunny outdoor settings, the iPad Air’s 8MP rear camera performs the best with average looking details accompanied by accurate looking colors. It’s good, but not excellent. When there’s a strong contrast in lighting, it’s useful to have auto-HDR enabled because it tones down the scene so that the highlights aren’t overblown – resulting in a better exposed composition. However, we do notice that HDR shots tend to come out softer in tone. Not surprisingly, though, its low-light performance is pretty bad. When there’s extreme darkness in the scene, the whole shot just appears dark and severely under-exposed. Details are lost due to this, but there’s barely any to find even when there’s some lighting around. While we do like how noise is kept to a minimum, the sacrifice is seen in the muddy details and under-exposed results. It’s a total wash in our opinion. Thankfully, the front-facing 7MP selfie camera boosts its performance over its predecessor. There’s a fair amount of details that we can make out from taking selfies with plenty of lighting around, but the post processing tends to be more liberal with the saturation. Aside from the obnoxious looks you may get from taking snapshots using the iPad Air, we really would still refrain from using it for capturing photos. If it’s the absolute last resort when nothing else is within reach, then by all means use it – especially when the lighting conditions are good. Outside of that, you can pretty much forget about it. You’re not going to find anything better with the iPad Air’s video recording performance, especially when it tops out at 1080p resolution. For a tablet with formidable specs, we certainly expected more in this area with 4K video recording. Instead, it’s a forgettable performance that’ll make you want to skip using it in the first place. In addition to being a workhorse for getting work done, the iPad Air is also pretty good for media consumption. Watching videos on the Retina Display is a feast for the eyes, delivering crisp details and punchy colors that keep us affixed to it. Over on the audio side, the dual speakers of the iPad Air are decent for most things, but don’t expect the same heart pounding tones produced by the quad speaker array that’s found on Apple’s iPad Pro line. Still, the dual speakers here are still stronger in tone than most smartphone or tablet speakers. And we still gladly accept the 3.5mm headphone jack for its convenience in being able to pop in our favorite pair of wired headphones without the frustrations of being forced to carry around and use dongles/adapters. Combining the optimizations that accompany iOS 12.2, in addition to ones that come with the newer A12 Bionic chipset, the new iPad Air is naturally expected to deliver better results in the battery life department. On a day-to-day basis, we’re able to easily get through the day with about 50% capacity leftover with normal usage. Power users, though, will also be pleased to know that its battery is still capable of getting a solid one-day of usage. In the grand scheme of things, we’d put it at above average. Using the included power adapter to recharge the iPad Air, it still requires a painstaking amount of time to get it back fully juiced. In an era when fast charging technologies in some top of the line phones get them back to full capacity in about 100 minutes, the 235 minutes it requires for the new iPad Air is just frustratingly long compared to its contemporaries in the tablet space. Take the Samsung Galaxy Tab S4, which only needs 192 minutes. If Apple were still selling the aging iPad Air 2 brand new for a significantly discounted price, we’d probably recommend that over this newer one. However, that’s not the case. In reality, the new iPad Air (2019) takes up that vacant spot long held by the iPad Air 2 at the moderate $500 price range. After years of Apple trying to sell consumers on upgrading to its more expensive iPad Pro tablets, the new iPad Air’s arrival is a sign of relief. tablet, superior display, and the faster A12 Bionic chipset to handle all of your day-to-day tasks. Against the $800 priced 11-inch iPad Pro, the gains may or may not be huge depending on what you’re going to be doing. If it's just everyday stuff, like checking out your social media accounts, sending emails, and the occasional video watching, then you won’t benefit going with the iPad Pro. Conversely, if you’re an enthusiast that wants to precisely edit photos, produce videos with high production quality, then yeah, it’s a right fit for you. I don't see the point in reviewing this product, same as the old iPad design, running the same boring iOS for many years now, just a bigger screen. I mean, I'm bored on behalf of the decent apple fans out there. 9.0 for the same design, same capabilities and same old boring. All tablets based on ARM are just boring. Not useless, just boring. Its a 11" kids toy with tons of kiddie flare. Though not in the same category, the Surface is just BETTER in everything for less cost. You get a more power GPU and CPU overall. You get access to both dedicated and mobile apps. Unlimited storage capability, better battery-life, better keyboards, pen is included and its more portable too, being a bit smaller. any tablet that isn't running Windows, is just a toy overall. Sure you can get stuff done. But ARM hardware is not the same caliber as x86. So pricing them the same is very deceiving. The Surface is such a different kind of product for a completely different audience. It is designed to be used with a keyboard (for example, windows 10 on screen keyboard does not pop up automatically when selecting an area where text needs to be typed). Without a keyboard, it is a mess. The surface line up is competing with laptops, and less with tablets. If you want an actually good experience with a touchscreen and use it for illustrations, multimedia or reading stuff, I guarantee the iPad is a better fit. When you guys understand that the surface is mediocre tablet and mediocre laptop. If people want great laptop experience they buy laptop. If people want great tablet experience they buy iPad. You sound like a bitter Apple fanboy. They are just opinions...calm down. The Surface is a far better tablet than any iPad. The top-end supposedly "pro" device is touted as a laptop replacement and fails miserably. The Surface is just a more productive tablet that can replace a laptop, even a desktop. I have an i5 256gb model on my desk paired with a Kensington 4000 docking station a 2TB hard drive and 43" 4K monitor. It never misses a beat. Try that with you iPad, you cannot do it. If I want to use it as tablet, I just take out the USB connecting to the docking station and it can still do all the things I do on the desk. Volume does not indicate how good a product is, the iPhone is proof of that. The Surface is what the iPad Pro tries to be but fails miserably because of an outdated, toy operating system. "Volume does not indicate how good a product is" usually it does when the price is in same category If the product is good people eventually find it, just like what happened with iPhone, it wasn't instant hit, it took until iPhone 3gs to really people understand how good this noname phone brand is and end is history. Your end comment is showing that you don't understand why surface sales are so low. IPad Pro doesn't try to be surface, IPad pro is tablet, it doesn't try to be laptop like surface tries, surface trying to be laptop and tablet which just sacrifice both usages and that's why very few want one. What is the difference with Surface from OS level? Isn't it the old same Windows? "more powerful CPU and GPU overall" Sigh, this tiring biased ignorant paradigm still runs rampant. BS narrative that is really getting cliched and old. The A12 Bionic is FAR above any laptop CPU/GPU in the 800$ price range. Get some clue for once. Go see laptopmag's iPad pro performance analysis (not allowed to put links here) where they conclude it "blows away windows PC's". Leaves even core i7 far behind in 4K video rendering test. On top of that, the GPU is 2-3 TIMES more powerful actually(1.2FFLOPS of peak performance), all the while being packed inside a far lighter, more compact tablet with much more battery endurance. The technological superiority of Apple over Intel is just RIDICULOUSLY huge. This being said, this iPad is a failed product to me because of disastrous structural rigidity. No matter how powerful you "think" the CPU is, or what benchmarks say, iPad's are simply not as powerful as any PC. The A12 is powerful, but you will never know how much, with Apple constantly skimping on features. What does the iPad do now it didn't do in 2010? Splitscreen apps is basically it. Samsung's own latest laptop using Snapdragon, benachmarked, shows it was slightly less powerful than an Intel i5. The A12 or even the SnapDragon can't even remotely touch a full scale i7 or even XEON chipsets. The A12 benchmarks on paper are impressive, but when you look at iPad and iPhone and compare them to other tablets and smartphones, especially anything made by Samsung; the A12 is simply not doing what other devices are doing and thus the numbers on paper mean nothing. Today's iPad overall, does less than the Note 12.2 from 2014. at least the Note 12.2, can screenwriter 4 applications, and have windowed apps on top of it. iPad? only 2 split-screen apps. and that Note is only using an old SnapDragon 801 chipset. here we are 5 years later and the iPad can't even match. Same as today's iPhone on some level is lesser than a 5 year old Galaxy 5. Umm, I'm no Apple fan, but benchmarks and tests are what you have to rely on performance. It's one thing to not like a product, quite another to just blindly discount actual data. Note, I do own an iPad pro (older gen), and it's doing a great job as a tablet. My personal main use case is drawing with it and it's excellent in that regard. The real killer feature for me isn't in the hardware actually, but an application called Procreate. It can almost completely replace Photoshop for me, which I've used for about 19 years now. And THAT is what makes it impressive. Otherwise I hate the Apple OS, it's just terrible and un-intuitive, and this comes from someone who has used just about every major flavor of Linux and desktop GUI. No file manager? Instant fail for production purposes. The best you can get out of the product is that once you produce it, you can export it to Dropbox and then actually finish a project. Even the iPad "Pro" will remain a toy until they resolve these issues. I'll sum it up in two words , its garbage . 9 is the most humble and objective. But i think it deserve 9.99. Jetstream benchmarks are wrong . Other online mag test shows 265 points . Also the iPad has the same processor with my iPhone X plus so jetstream but be the same or better . A really decent tablet with a really short list of cons. Rating is ridiculous ofc. we are on PA after all, but it's certainly a decent 7.5 or even 8/10 tablet. Seriously, who cares for a dated design, I would prefer iPad Pro being in iPad Air 2019 case any day - at least it does not bend and it has a FPS and jack. Why is this one getting 9 and the Pro getting 8.5? ?